Innovating Suture Removal One Stitch at a time. An Improved Way of Removing Sutures. 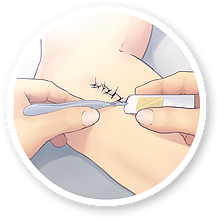 SutureOut is a sterile, disposable suture removal kit that is intended for removing multiple stitches from a single patient. SutureOut was invented by Robert Backstein, a plastic surgeon from Toronto Canada after witnessing his daughter's discomfort have her stitches taken out. This observation was the final indication he needed to move forward with developing the product, having received numerous comments about how challenging some of his sutures were to remove (tightly-tied and small). He knew it was easier to cut sutures from the outside and felt comfortable to remove sutures using a 10-blade, but he knew it was something his nurses avoided. They were apprehensive about using an exposed blade, especially when treating children and uncooperative patients. Backstein recognized the importance of cutting from the outside and set out to develop a simple, low cost disposable that would ensure nurses to comfortably cut sutures from the outside. The added bonus was the degree to which tension on the suture was reduced by using the new product since it eliminated excessive elevation to access inside the suture loop that is needed with conventional suture removal kits. The reduced tension made the experience significantly more comfortable for the patient. A win-win for both patient and practitioner. 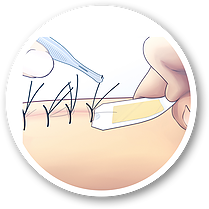 Perhaps most importantly, cutting sutures with SutureOut significantly reduced the amount of time nurses were spending removing sutures, especially in cases of tightly-tied knots and embedded stitches. Effective and Efficient Suture Removal Kit. To become a prominent Canadian developer of innovative medical products and devices. To develop innovative, cost effective medical products and devices that increase practitioner efficiency and improve patient outcomes. Why is SutureOut the Best for Innovative Suture Removal? SutureOut's "outside-in" cutting approach is quick, easy and super versatile - making removal embedded and tightly tied suture loops way easier. Just press the cutting edge under the tied knot to sever the loop and remove the stitch. Scissors require getting a tip inside the tied loop. This can be challenging especially for tight sutures. Lifting the tail to get the tip into the loop can cause discomfort to the patient and can even disrupt the wound. SutureOut uses a guarded-blade design that makes accidental injury to the patient's skin highly unlikely compared to the unguarded tips of scissors or #11 scalpel blades. Practitioner's are reassured knowing the process is not hurting the patient. Using scissors can be challenging especially in the cases of tightly tied stitched and uncooperative or anxious patients. The unguarded tip of scissors or a scalpel blade is prone to damaging the patient's skin or even the healed wound. Removed knots are effectively collected on SutureOut's tacky surface. 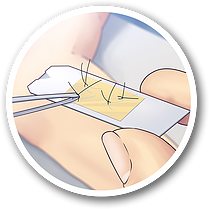 No cleanup of scattered sutures saves time and makes up for a more hygienic work space. Avoid ricks associated with reusing scissors. Preparing gauze or basin to collect removed sutures becomes unnecessary with SutureOut. It removes stitched and allows you to collect them with one product! Once done, dispose of SutureOut - with all the removed sutured attached - in any sharps container.